Congratulations Flowers from £16 at eFlorist There is no other way than to send your congratulations with a bunch of beautiful flowers! Up to £15 Off Selected Spring Flower Bouquets at eFlorist Make sure you take advantage of this amazing discount at eFlorist! Anniversary Flowers from £22 at eFlorist Commemorate that special day with a bouquet! 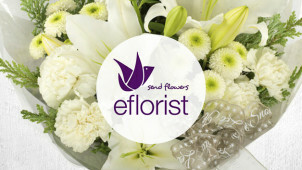 Up to 50% Off Selected Bouquets at eFlorist Save up to a whopping 50% off selected bouquets at eFlorist! Rose Bouquets from £9 at eFlorist Treat you loved one with a special treat at eFlorist! £15 Off Rose and Lily Bouquet Plus Free Chocolates at eFlorist Perfect for Mother's Day! Make sure to check out this great deal and get £15 off Rose and Lily Bouquets. Up to 30% Off Selected Anniversary Flowers at eFlorist Find the perfect flowers for your loved ones at eFlorist! Birthday Flowers from £9 at eFlorist Say Happy Birthday with a bunch of beautiful flowers from eFlorist. Up to 50% Off Selected Thank You Flowers at eFlorist Let your bouquet speak all the words you cannot whilst saving as much as 50% in the process at eFlorist. Gift Hampers from £20 at eFlorist Find the perfect gift at eFlorist with gift hampers starting from £20. At eFlorist, it becomes clear that there is a bouquet to suit every person and every occasion. Since the start back in 1947, eFlorist has been highly regarded as a reliable and successful business, as pioneers in the flower retail sector, you know that you will get nothing but the best from eFlorist. Supporting local economies and florists throughout the UK who hand deliver many of their products straight to your door - eFlorist is a household name in beautiful flower deliveries. For a lovely surprise and for key events - you can save on bouquets of the highest quality here. Shop by your price range or by occasions such as New Baby, Get Well, Romantic and more. EFlorist listens to the needs of its customers and will always bring you seasonal flowers to suit everyone's home style and personality too. So don't wait to light up your life or another's with an arrangement today. With products that can be as personal as you'd like, include special notes and other extras as you wish - the options are endless with eFlorist. How do I use my eFlorist discount code? Click ‘Apply discount code’ then continue to checkout and complete your order. When you subscribe to eFlorist, you will be signing up to a world of amazing discounts and offers on nothing but lovely flowers - all delivered straight to your inbox. How long will my flowers stay fresh for? eFlorist guarantees freshness for 7 days. How can I pay for my eFlorist order? You can rest assured that your payment will be taken securely with eFlorist, you can use any major credit card and also pay through reliable PayPal. Delivery is included in the price of the bouquets themselves, it is up to you to choose one to suit your desired delivery time frame that is also within your budget. Same Day Delivery starts at £26.50. Standard, Next Day Delivery and Sunday delivery are also available - flower and bouquet dependent. Email customer.services@myeflorist.co.uk or call eFlorist on 0333 577 6635. You can get in touch Monday to Friday, 9:00am to 5:00pm and Saturdays, 9:00am to 3:00pm, the eFlorist contact centre is closed Sundays. Summer's here - the season where flowers look their best! Surprise a loved one with a dozen red roses or more and save with your nifty eFlorist discount code from us. That’s not to say that singletons can’t join in on the floral fun, with the latest seasonal additions to eFlorist, you’ll be able to spruce up your surroundings with sunny bouquets to suit your style perfectly. The experts in flower arrangements and beautiful bouquets have more to offer than meets the eye. Gifting really is the priority at eFlorist and here you can even find a stunning collection of summer Hampers to suit every occasion, person and taste. Think a birthday, new job, an anniversary, or any occasion which calls for a little extravagance - the wicker hampers are filled with gourmet goods, luxurious treats and more - this gift is sure to go down a storm. Who doesn't like a little inspiration when it comes to finding a gift for another or perhaps even a treat to self? When we want some fresh ideas for our flower orders, we look to the Florist Choice section at eFlorist. With an eFlorist voucher code you can find celebratory bouquets of the finest flowers to bring some colour and delight to your home for less. Lilies, roses and more are waiting to be snapped up at a great price here.